Yes I know it is rather late to be posting about this but I thought, seeing as I am a graphic designer; an artist, I need to give my opinion about stuff like this. 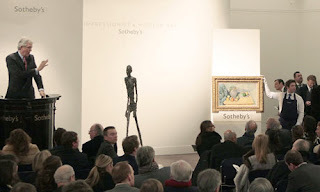 Now, if you don't already know this already the picture above is of Alberto Giacometti's piece called L'Homme qui marche. Now if you have eyes like me, it's just a statue right? Wrong! That piece cost a whopping £65m! Now that, as you might have guessed (Why am I still talking to you as if you don't know anything about this story?) is a world record and of course it was a centre of a massive debate. Which is rightly so because we live in hard times financially and people are still willing to shell out these vast sums of money for something so trivial. As you have probably guessed, I am annoyed by this. Let me tell you why. First off. Let's not beat around the bush. It's just a piece of sculpture. Yeah it's nice but it isn't really anything that special. ANYONE could have made this. I just do not see the appeal. Sure, it's a nice looking piece but maybe £50 would even be a stretch! I mean i too. I would be a bit annoyed if I had to pay £50 for this. This leads me onto another point. People seem to pay these stupid amounts for pieces because of the critics and the museums saying "This is a must have piece" and stuff like that. Why not pay £10 for something that looks nice instead of paying silly amounts for something that is priced based on a "professionals" opinion? There are a lot of pretentious people out there (just go to the Tate Modern) who have more money than sense. At the end of the day I personally feel 2 people with big wallets got into a debate war and it went a bit over the top. I think it is a stupid example of the human condition. If art is about expression and visual impact, why are we swarmed with this pretentious attitude? Where have the days gone where you would buy a piece that looks nice? Why are we living in a world where it always about status? That's just my opinion anyway. Nice piece but overpriced. Nonsense! you may should try to put up such articles/critics as video form.